At the house in Carnegie, we had an old slide (which eventually got left there for whoever moved in after us) and a trampoline (which came with us, but in the end when we’d tired of it, got given to relatives who would use it more). 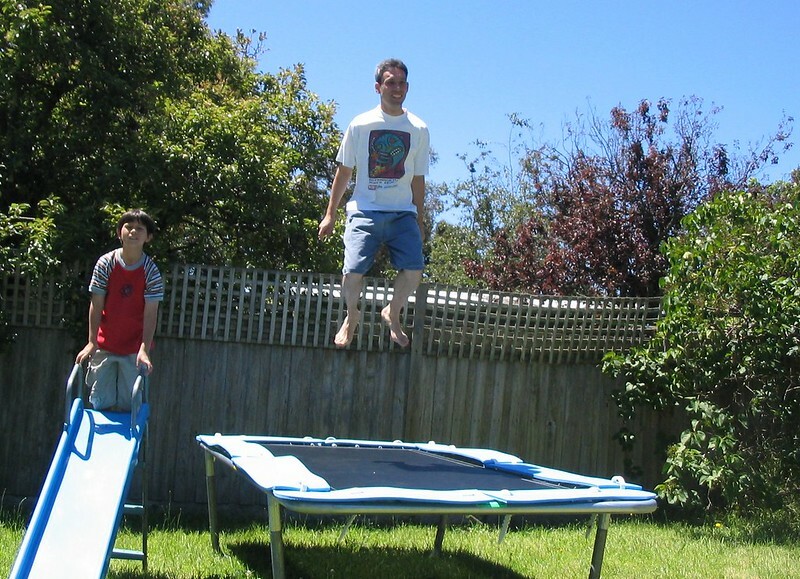 Here I am mid-bounce, with my ancient Reg Mombassa Mambo for Greenpeace anti-car t-shirt. 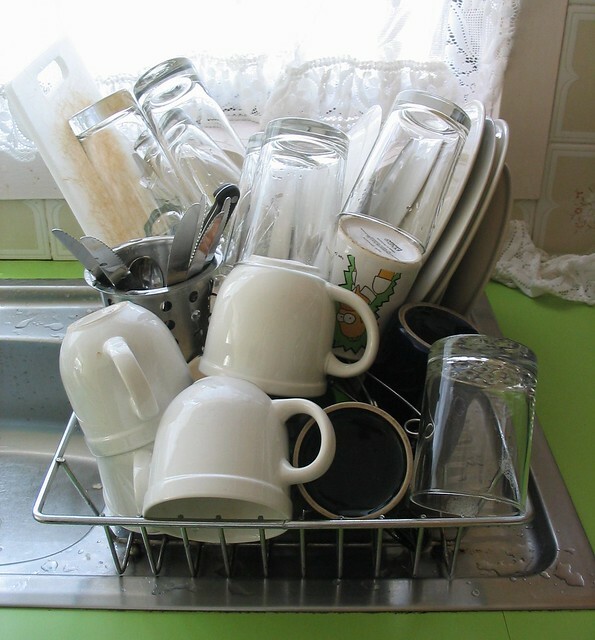 Back when I did the all dishes by hand. 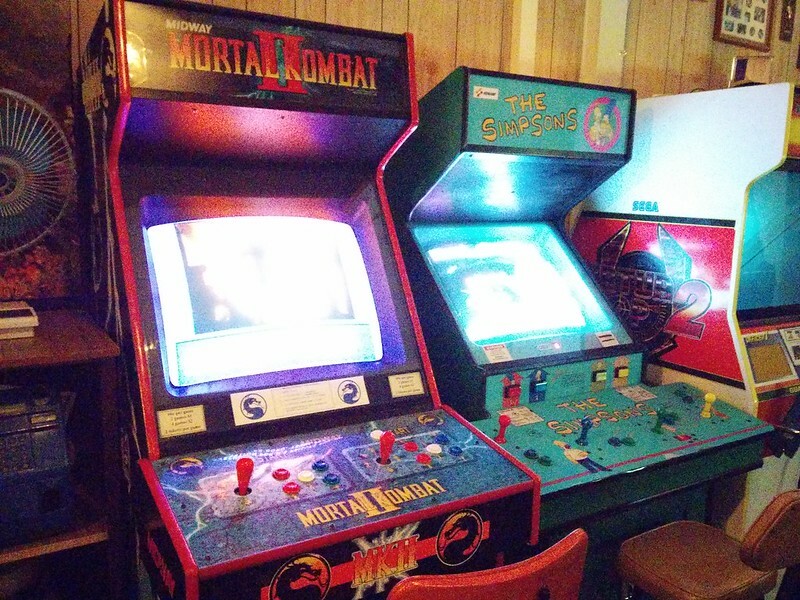 Nowadays most of these would go in the dish washer. I love having a dish washer. The dish rack lasted me about ten years, but rust started to get to it, so it got replaced last year by a slightly smaller one that fits better in the space I have. 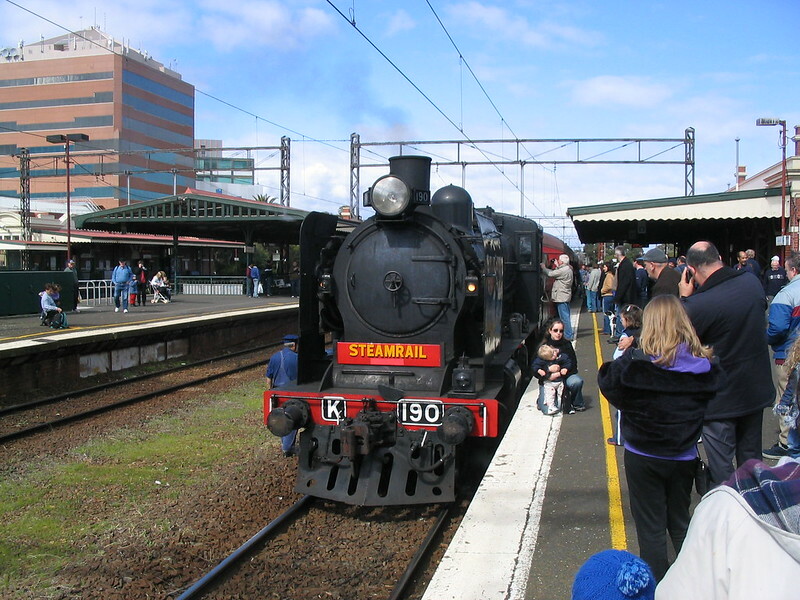 The train home from Warragul arrives. We’d gone down there for just a quick joy ride. Asleep on the train home from Warragul. Well, probably pretending to sleep, getting one of the kids to snap the photo. 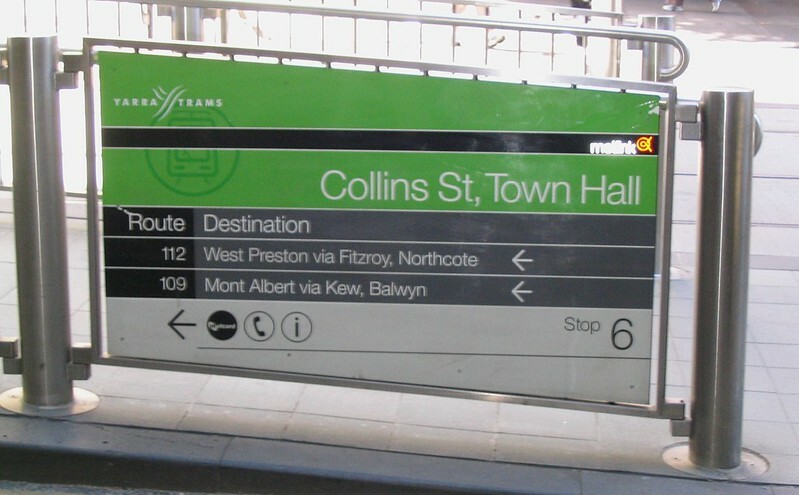 The Town Hall (Collins Street at Swanston Street) tram superstop opened in 2001. By 2003 route 109 had been extended to Box Hill. 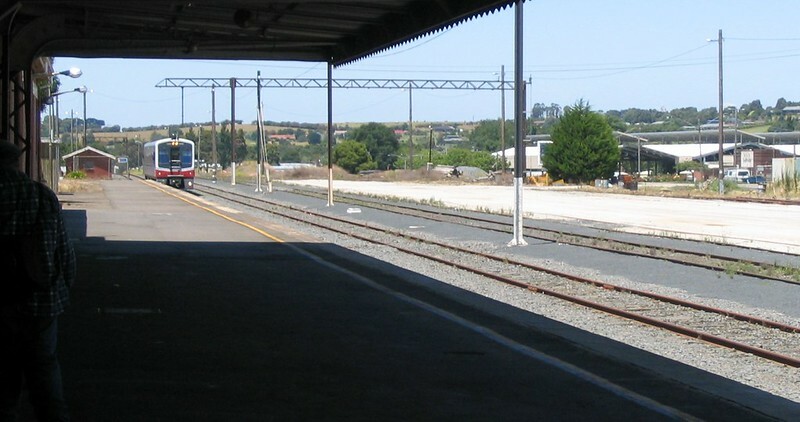 But by January 2005, the signs at the premier stop along the route still said Mont Albert. 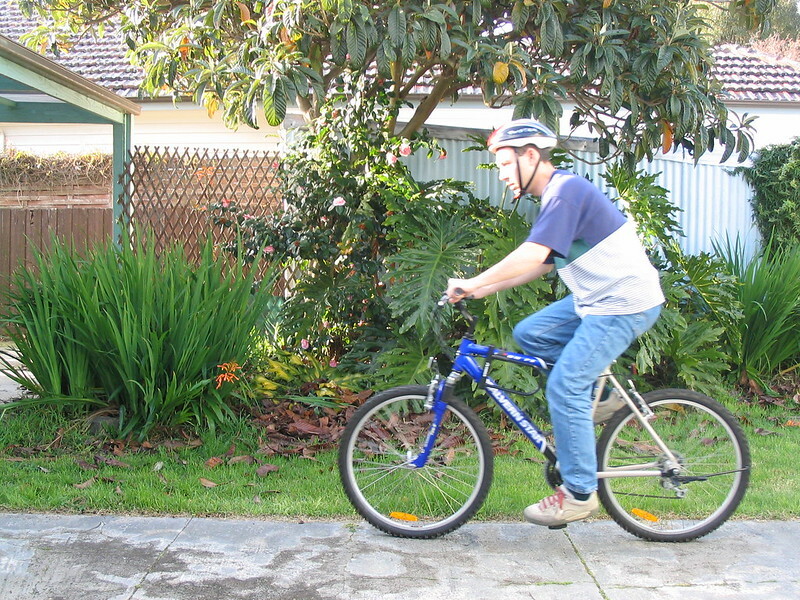 I think from memory I did send this photo around and eventually it got fixed. 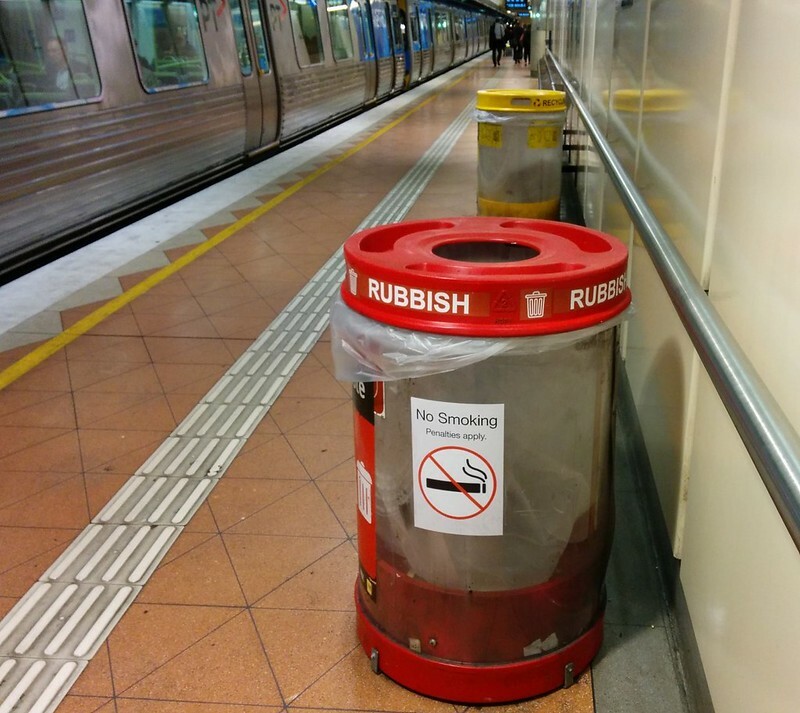 This type of thing eventually helped inspire the PTUA’s Problem Of The Day series in 2012-2013, highlighting mostly smallish public transport problems via photos. The Trugo mural in Yarraville. I added this photo to the Wikipedia article on Trugo, which is a sport believed to have been invented by railway workers in the 1920s. 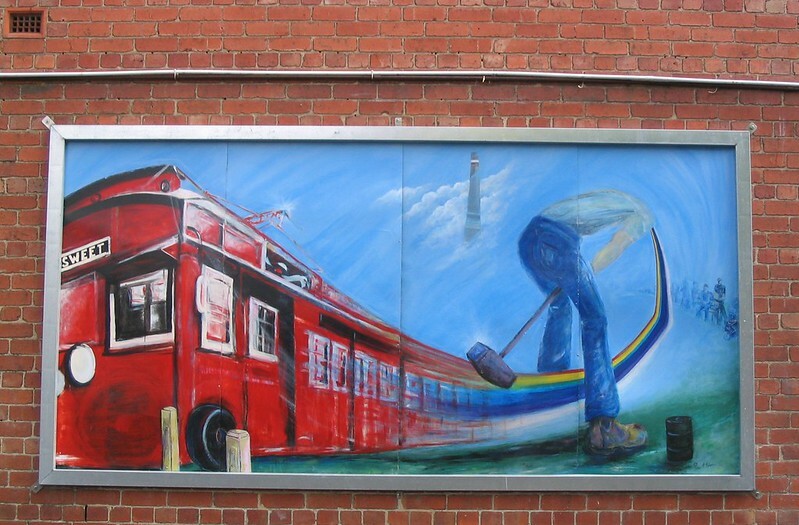 this image from Google Streetview, by 2009 the mural had deteriorated a bit. When I went past recently, they seemed to have patched it up, which is good. I thought I had a snap of it, but I can’t find it. 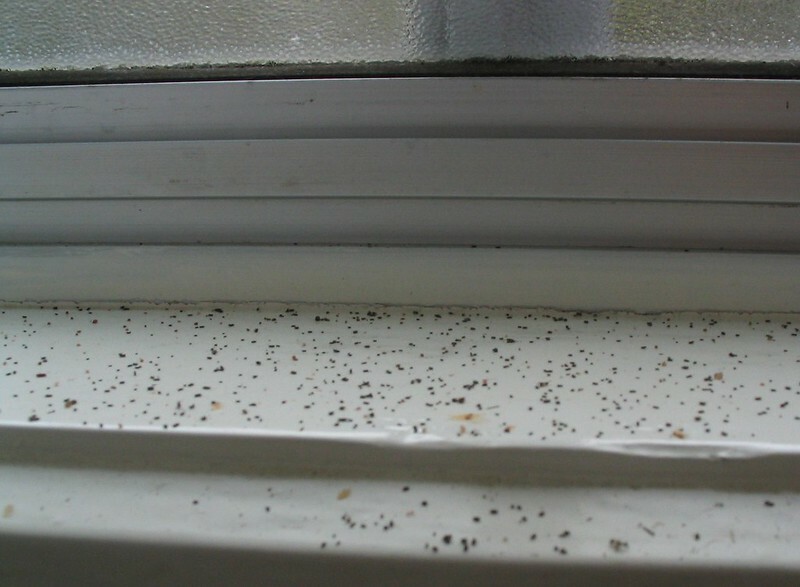 From time to time in the house in Carnegie that I lived in, this mysterious residue would appear, often around windows. I never figured out what it was, but I note with some alarm that occasionally something similar appears on one of the window ledges in my current house. It can’t be good, right? 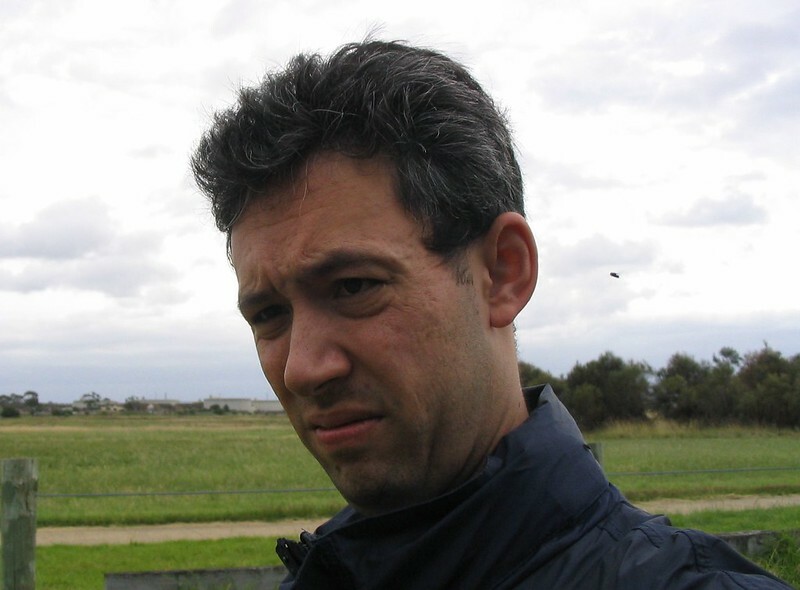 I’m not panicking though — I’ve got a guy coming in a few weeks to do some repair work; I’m sure he’ll sort it out. 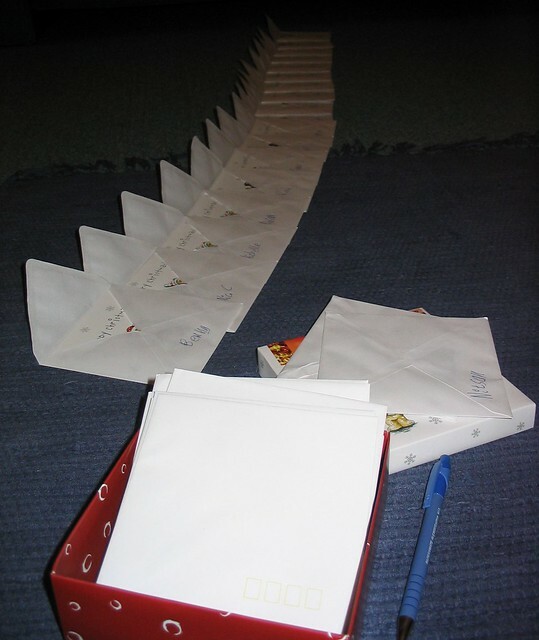 This looks to have been an attempt by Isaac to write Christmas cards to all of his classmates. 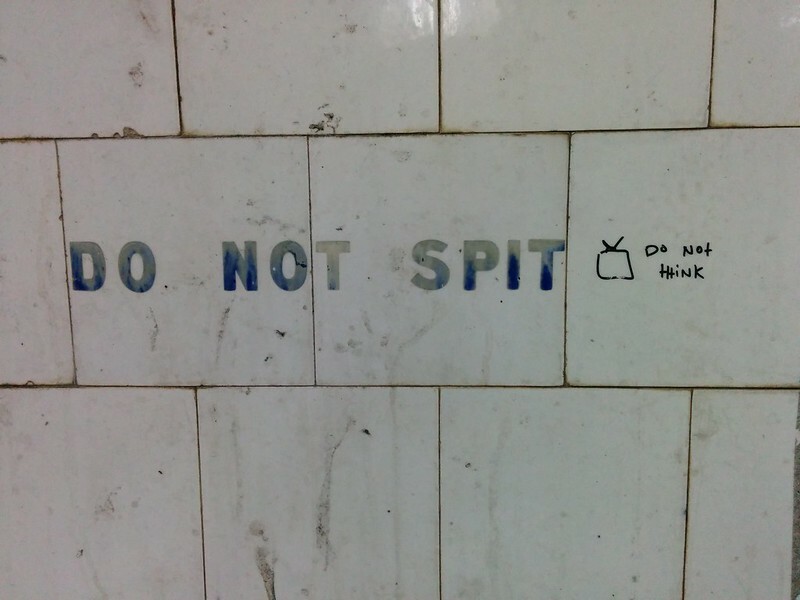 I gather some school kids still do this. From a walk around Altona Beach with M and the dog. There were lots of flies… evidently I wasn’t having a good time with so many of them buzzing around. 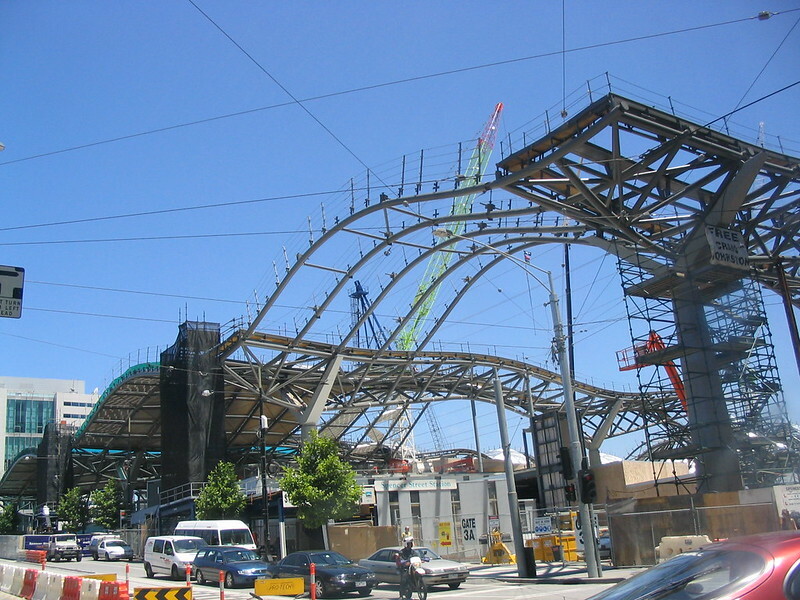 Another snap of Southern Cross Station under construction. 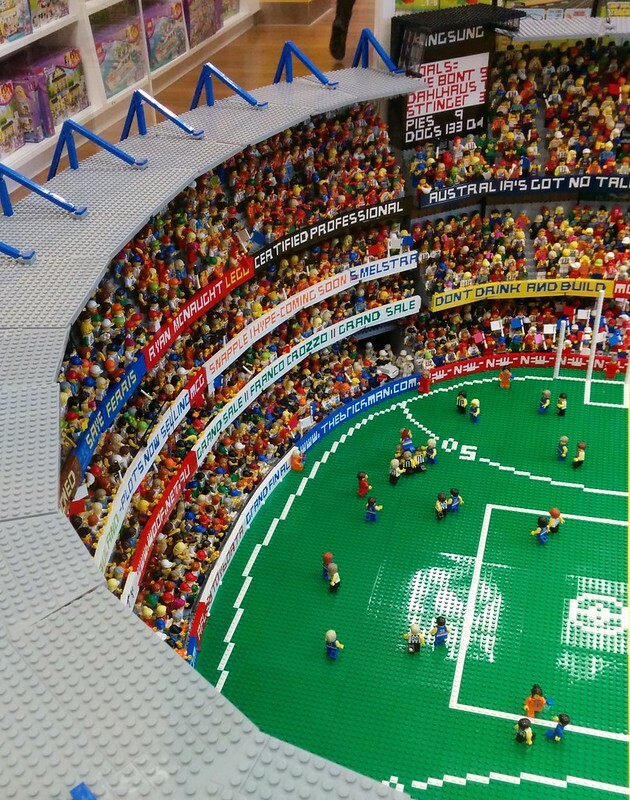 This photo would have been taken from the south-east corner, at Collins/Spencer Streets. Finally, a photo which isn’t from 2004. This is just a few weeks old, and is to wish everybody reading a very Merry Christmas and a Happy New Year… and an extra special thought to those who have lost someone dear to them recently. 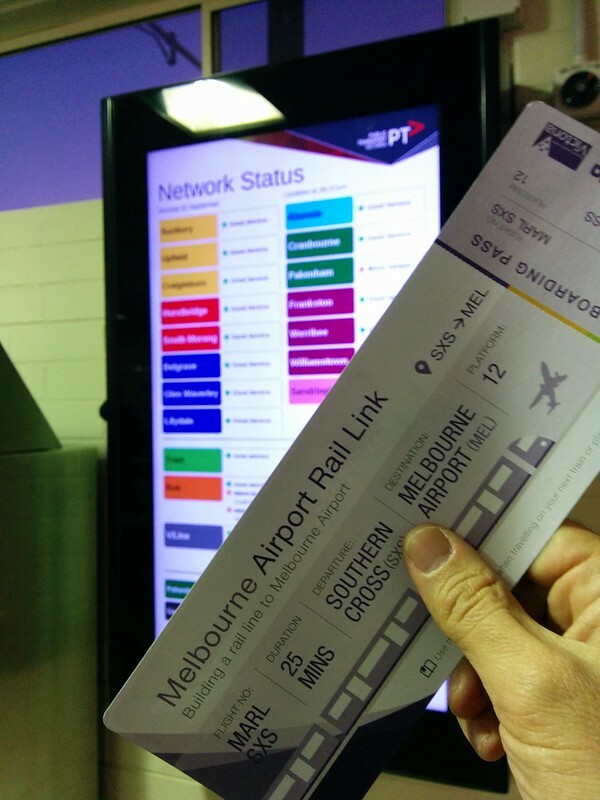 Having obtained a government-provided “boarding pass” (they were handed out with some MXs — I missed out but managed to get one via Kev, who saved it for me), I went searching for the airport rail link. Strangely enough it wasn’t listed on the network status board. 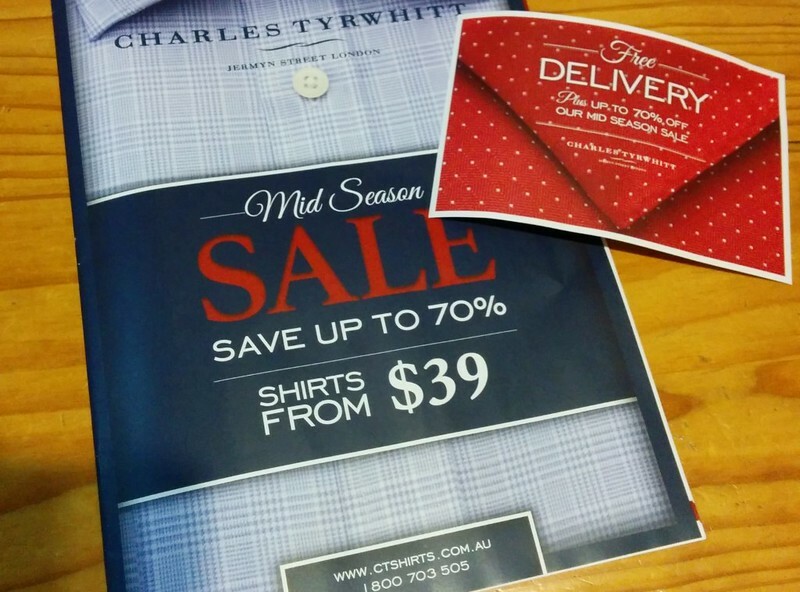 A while back I bought some shirts from that Charles Tyrwhitt mob who advertise a lot. Pretty nice shirts, and I’ll probably buy more from them. 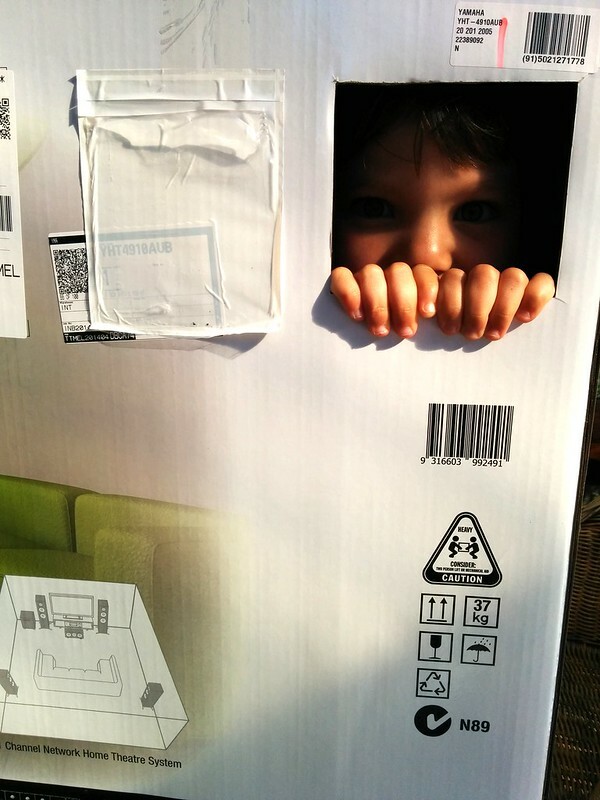 One thing’s for sure though, they WILL send you promotional catalogues and emails afterwards. You won’t feel neglected. 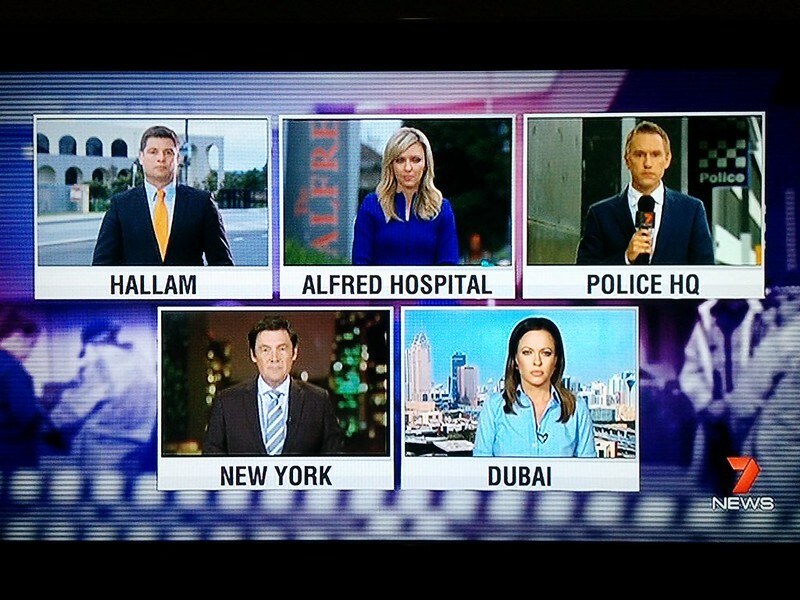 The channel 7 news the night following the Endeavour Hills stabbing. You know things are serious when they’re doing five live crosses for one story. Just a bunch of trams rolling down the road? Not quite — if you look closely, they’re going the wrong way, heading north along the southbound track. 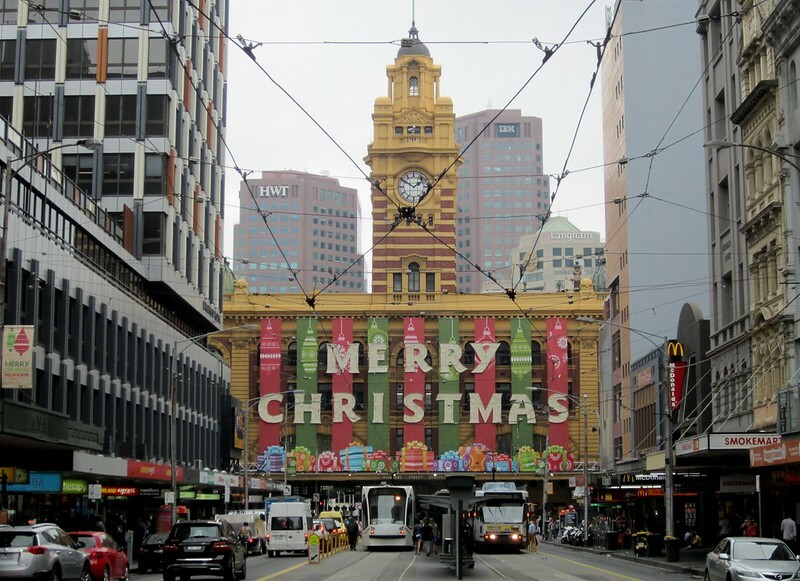 They were headed by a Yarra Trams car with flashing lights. 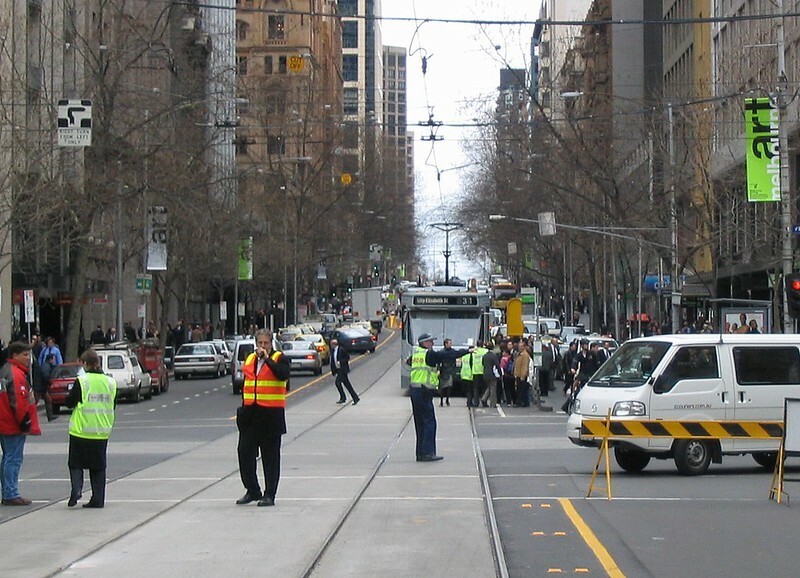 There was an underground fire at the corner of William Street and Flinders Lane, and Yarra Trams decided to move the trams backwards rather than have them stuck for an indefinite period. For reasons that escape me, this is known in tram circles as running “bang road”, and is rare enough that Marcus Wong shot video of it. 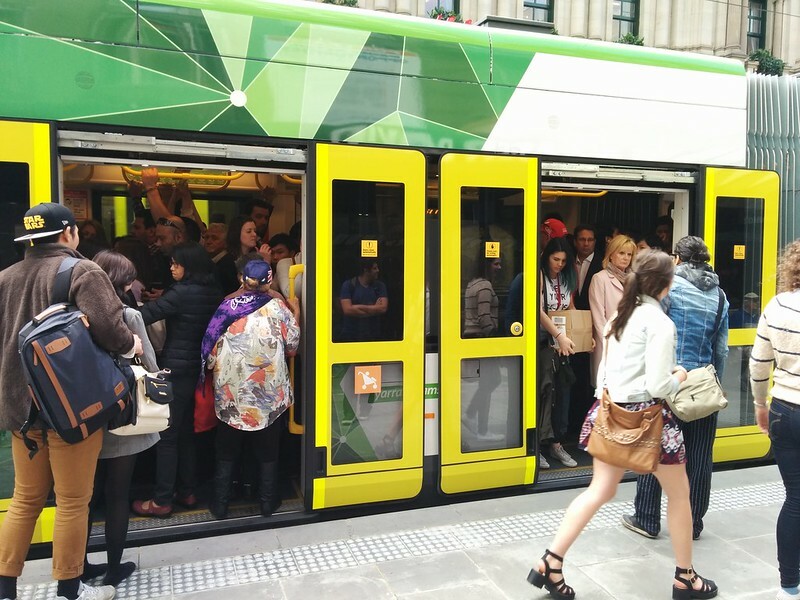 Here’s how packed some CBD trams can get — really testing the new E-class trams’ theoretical capacity. 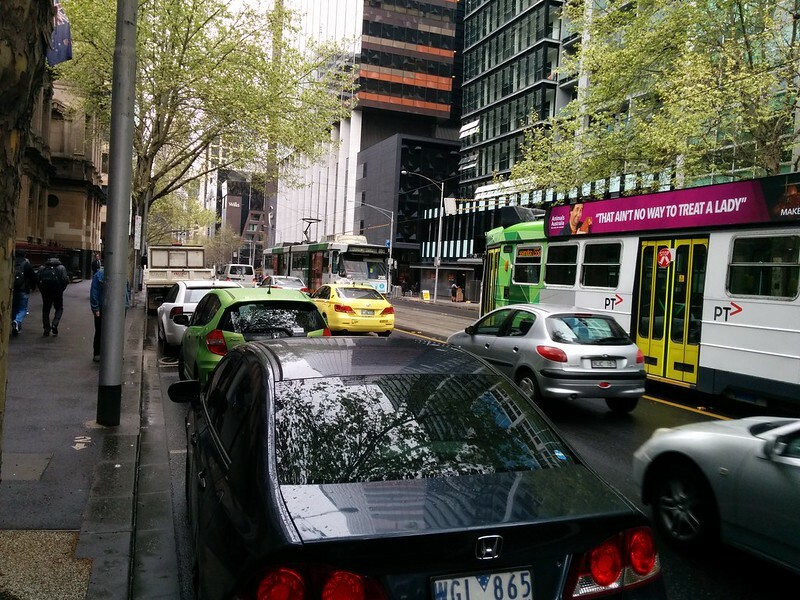 Now, how packed will it be from January when free CBD tram rides are introduced? Packed enough, I suspect, that I told a PTV survey person several weeks ago that, in all honesty, the change is likely to reduce my use of CBD trams — remembering that I have a Yearly Myki, so if I opt-out due to increased crowding, my paid rides will have been replaced by freeloaders. 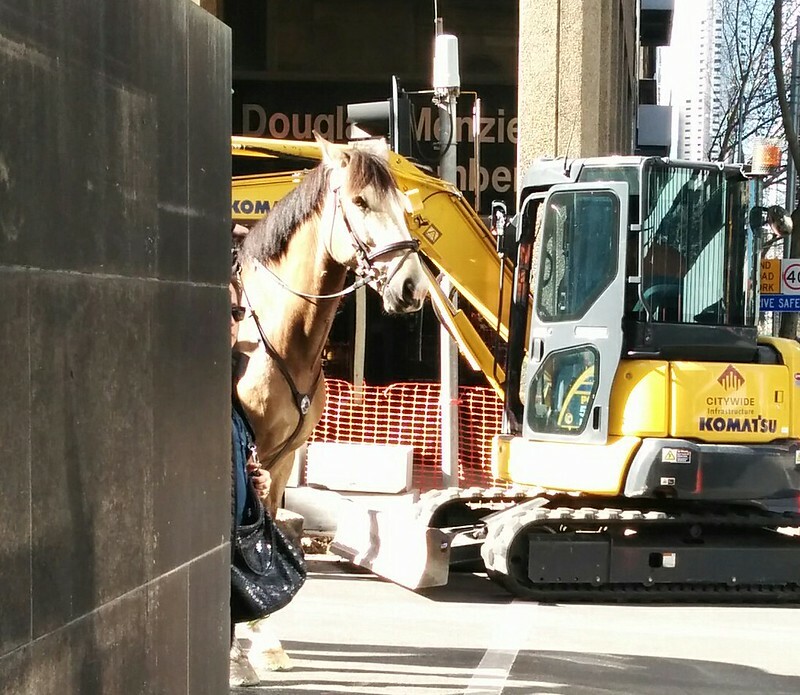 Spotted in Bourke Street one lunchtime. 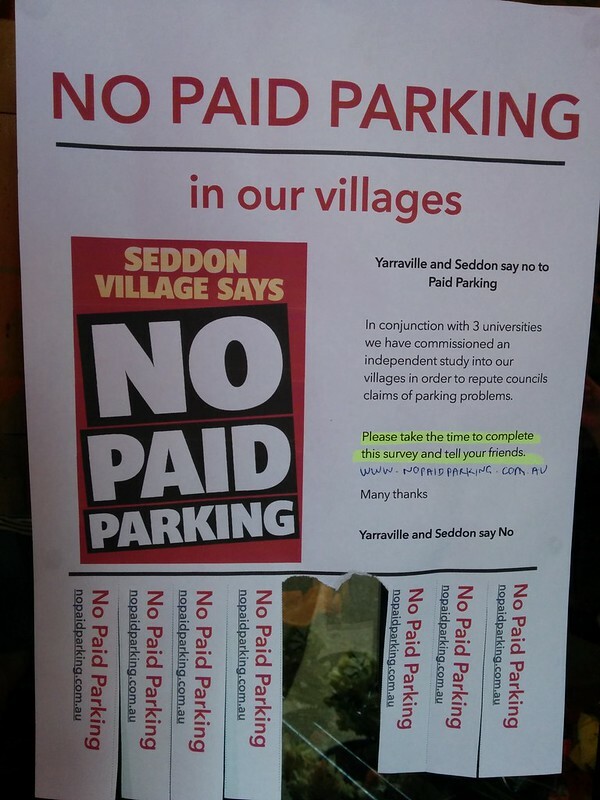 Seddon and Yarraville both have campaigns against paid parking on at the moment. 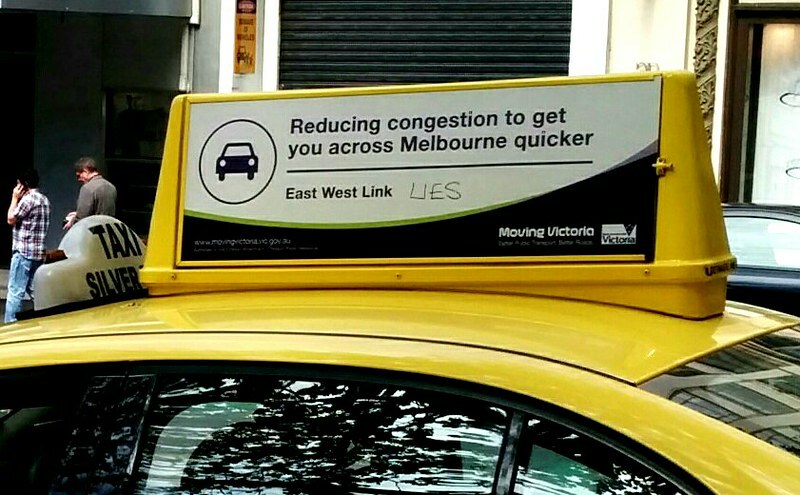 I’ve gotta say, having had the need to drive to both recently, and having spent ages (particularly in Yarraville) looking for parking, I think I’d prefer having a price signal to discourage people from staying longer than necessary and/or to go without their cars (both centres are quite well served by public transport). 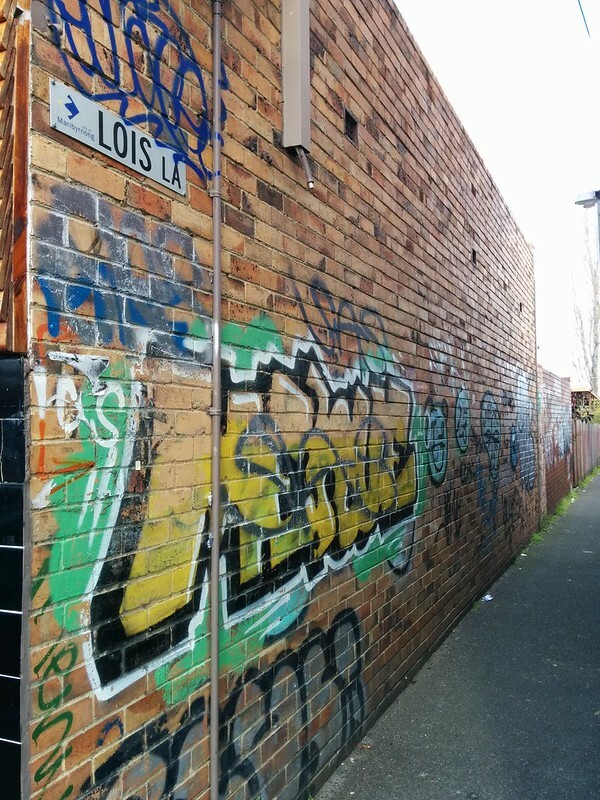 Lois Lane in Yarraville. No sign of Superman. Or Clark Kent, for that matter. 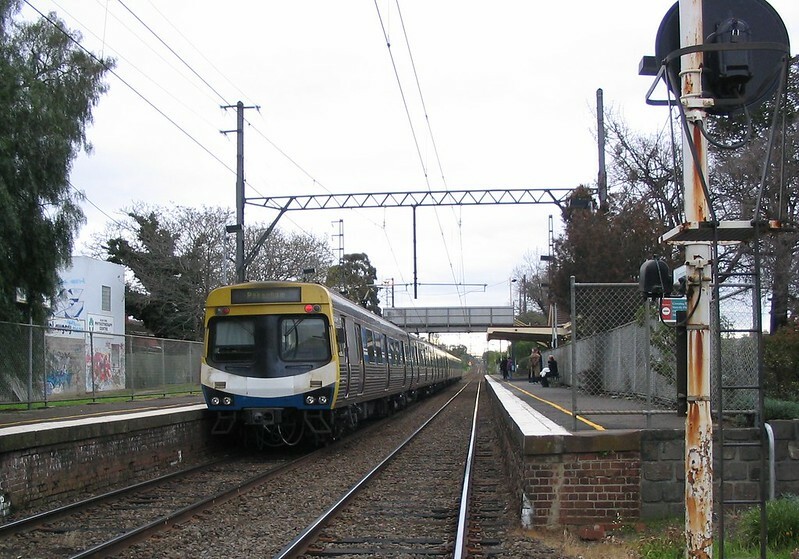 On the western suburbs train lines, there’s only a service every 40 minutes on Sunday mornings. 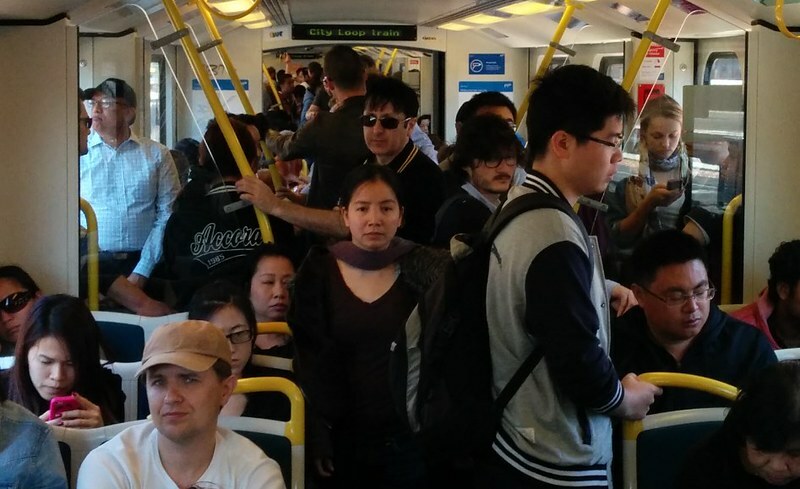 This is the result: the 10am train from Footscray to the city, packed to the gills. 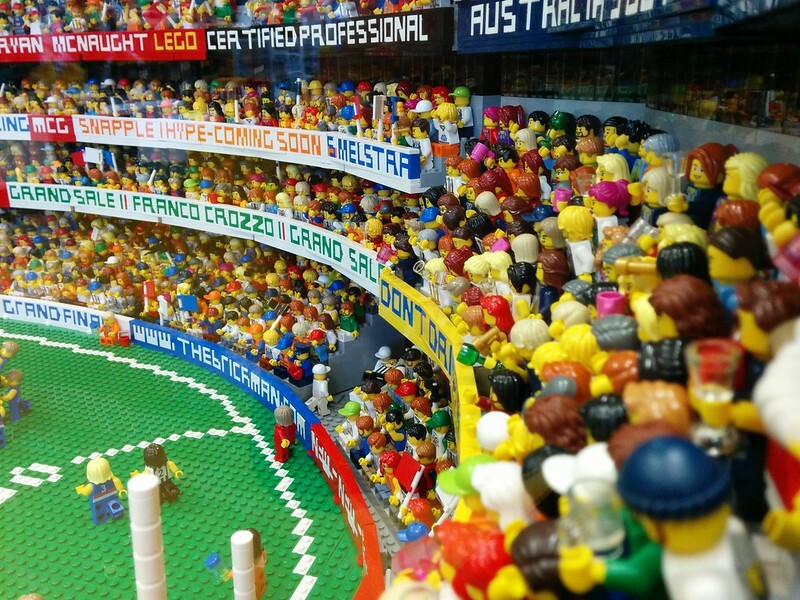 The Show is on, but even after North Melbourne, plenty of people stayed on board going into the CBD. 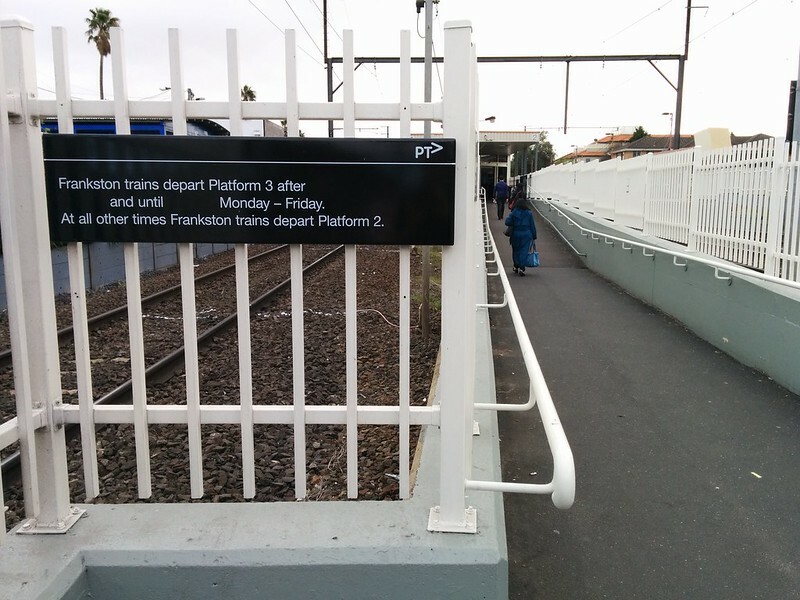 Not every square centimetre of floorspace was occupied, but it’s not good enough when the rail system has plenty of spare capacity, and should be trying to attract extra trips. High time extra trains ran on Sunday mornings. 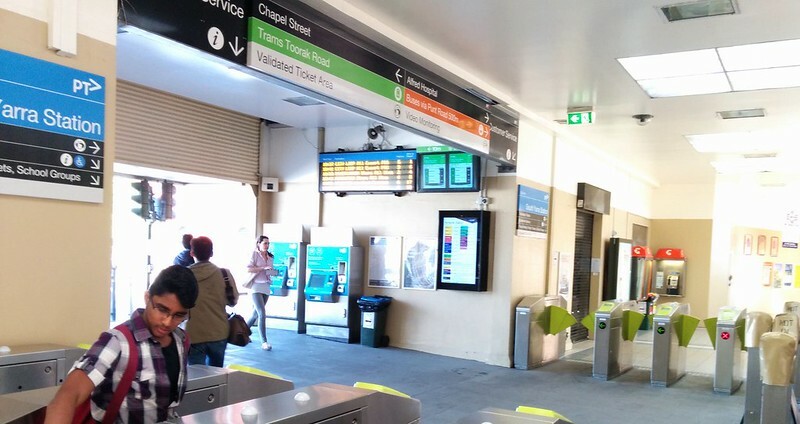 Both South Yarra and Footscray have six platforms. Sadly only one of them has live information on the concourse for all six platforms. 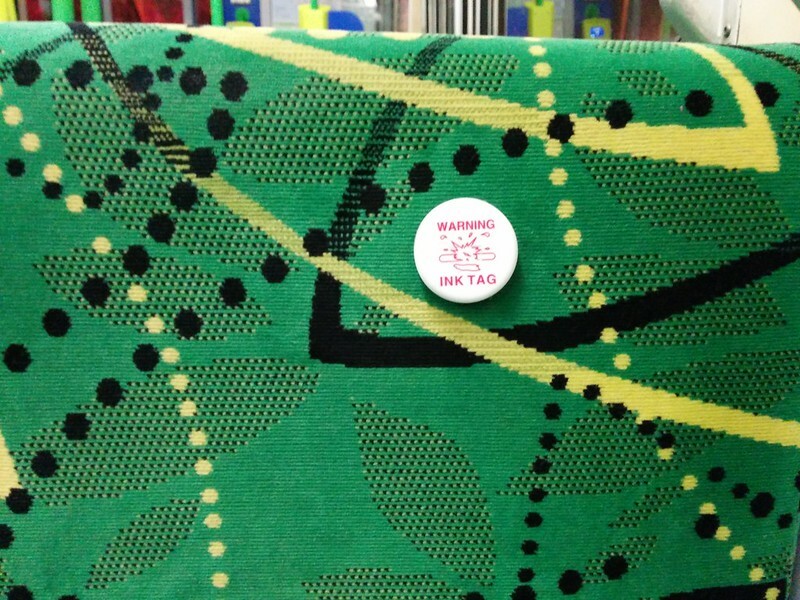 If you try to steal this tram seat, it could get messy. Flowerpots. Many flowerpots. 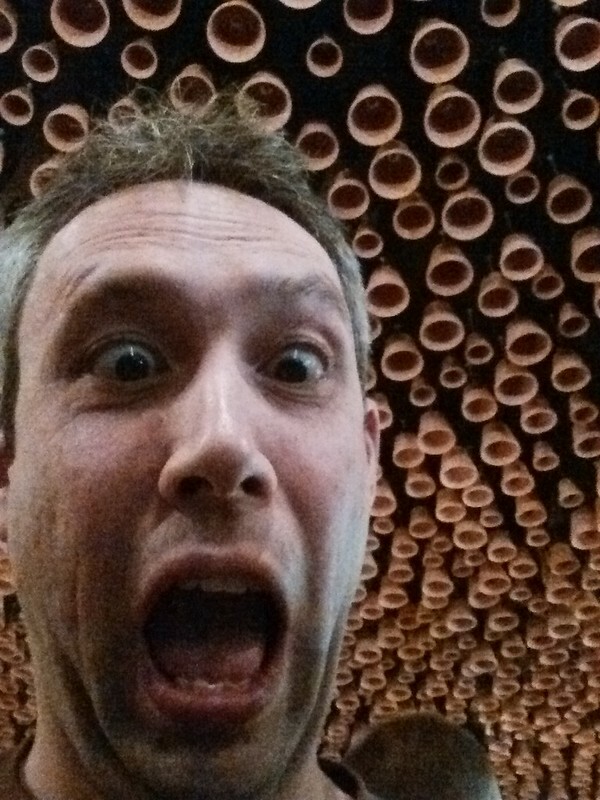 At Gazi, the modern Greek restaurant in the old Herald Sun building. 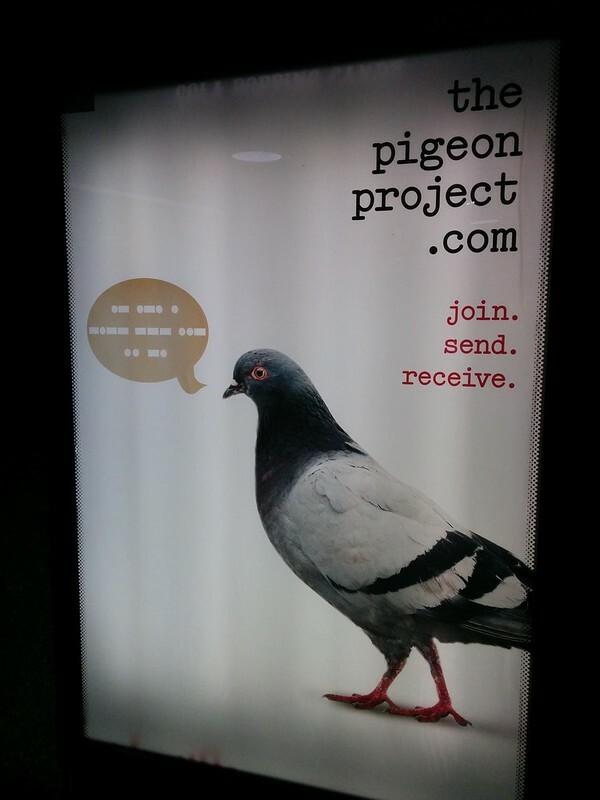 Lots of these ads around the place at the moment. What is it? 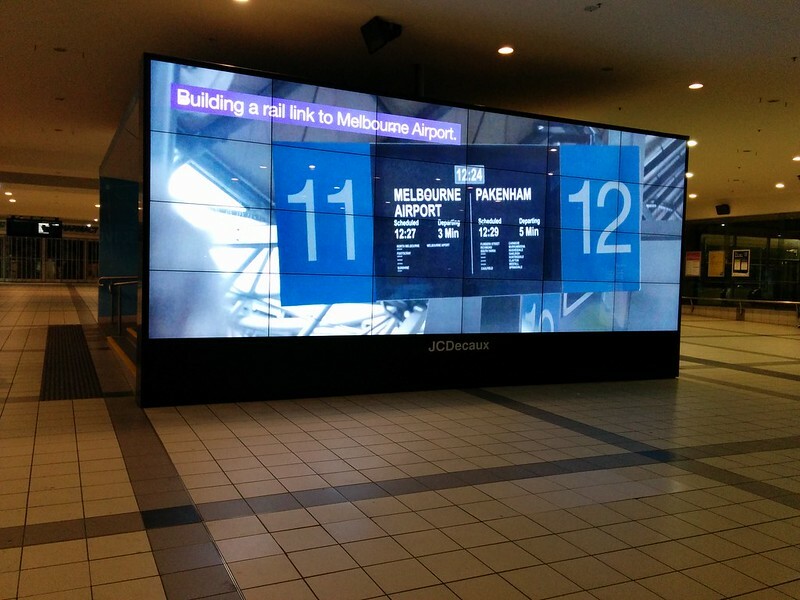 Some kind of big survey thing run by advertising company J C Decaux. If you’re wondering, the Morse code says “Are you in”. Apparently there’s a train to the airport in three minutes, if only I can find platform 11. Spotted in Collingwood. Must go back when I have more time.